Adult Protective Services Workforce Innovations (APSWI) is a training program of the Academy for Professional Excellence, a project of the San Diego State University School of Social Work. APSWI provides innovative workforce development to APS professionals and their partners. Our mission is to provide exceptional learning and development experiences for the transformation of individuals, organizations, and communities to ensure that abused and vulnerable older adults and adults with disabilities receive high quality, effective interventions and services. APSWI in partnership with state and national organizations has developed a nationally recognized Core Competency Training Curriculum for APS professionals. This curriculum is reviewed and approved by experts in the elder and dependent adult abuse fields. APSWI-APS is very excited to announce the completion of APS training videos! 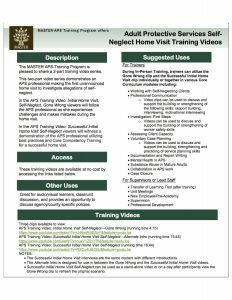 This two-part video series demonstrates an APS professional making the first unannounced home visit to investigate allegations of self-neglect. Please click on the flyer for more information and to access the videos. APSWI and its partner agencies have developed each of the National Adult Protective Services Association (NAPSA) Core Competencies into easily accessible in-person and on-line training modules. Each module is examined by skilled APS professionals and experts in the field to determine specific learning objectives. APSWI staff work with nationally recognized experts to develop evidence-based curriculum that builds on adult learning theory and teaches to the identified learning objectives. Once drafted, each curriculum is reviewed by curriculum advisory committees composed of APS staff, supervisors, and managers to ensure the training will meet the needs of APS professionals in the field. Each curriculum is piloted-tested, evaluated, revised, and made available for use in training.